Getting Started – If you have not visited Pinterest yet, the best starting place would be to lurk and explore the site first. You can search for specific content or just start clicking on images to see where you end up. Otherwise, getting started with Pinterest is pretty simple. You sign up for an account, complete your profile and can then start pinning. 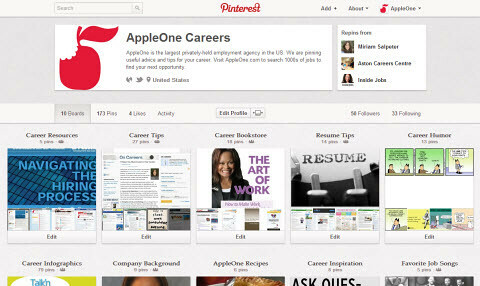 Pinterest has a Pin It bookmark applet that makes it easy to pin any web page. I highly recommend getting the Pin Page applet from Snapito. Since most of the content in the recruiting and careers industry is not visual, the Pin Page applet takes a snapshot of the page or article I want to share, and that becomes the visual to share. What the Pinterest payoff? – Obviously, shopping and e-commerce is fueling a lot of the Pinterest growth. The average order value for items ordered after seeing a picture on Pinterest is 2 to 3 times what a similar post on Twitter or Facebook can draw. For other businesses on Pinterest, it is mostly about experimenting with the platform and planting a flag as another source for raising brand and company awareness. Our recommendation is to experiment, start small and see where it takes you!